You want to enjoy a night out in a place that breathes history, where the Rolling Stones have played as well as some of world’s most famous symphonic orchestras? The Waldbühne is your place, this giant coliseum in the heart of the woods is Berlin’s number one open air location. 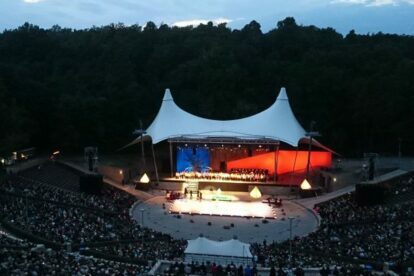 Recently, I was sitting there under the stars enjoying Mozart while thinking of the amazing events I have already experienced in the Waldbühne. Seeing my heros from the Star Wars Saga on screen in 1997, enjoying the magical blues of B.B. King in 2005 or laughing and crying to the wonderful lyrics of Leonard Cohen in 2010, the Waldbühne will always be my favourite event spot in Berlin, period. Every year, this “concert house” in the open air surprises with an amazing program and stars from all around the world – hey, it’s where Barbra Streisand gave her first concert in Germany after decades of not performing. Whatever program you are up to, you will probably find it there and have a nice evening in the most spectacular concert scenario Berlin has to offer. To get there, take the S5 in the direction of Spandau and get off at Pichelsberg.